"Look!" said Lapinette. "There's Leonardo's Cat, who carries on his master's work using old notes." "What it that flying contraption?" said the Wabbit under his breath. "It is a flying bird," said Leonardo's cat, who's hearing was sharp. "I oft observed these winged demons go about the tormentation of my species and so made my own." "That they should torment you further?" asked the Wabbit. "No! So that I could pursue them farther," said the Cat. 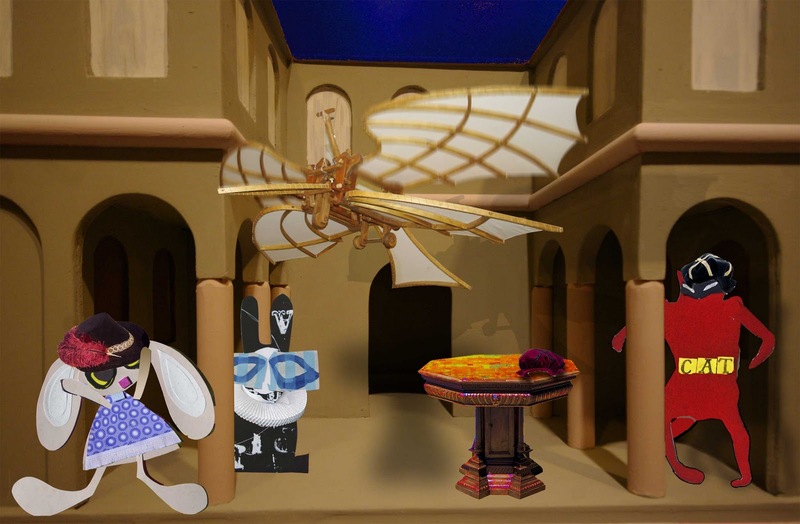 The Wabbit whispered to Lapinette. "Let's ask him if he has a larger one with levers and pulleys." "I wish you would address me here, and I will answer you directly," said Leonardo's Cat. "I have a larger version and I did labour long and hard in its creation." "No rude mechanical you, that sports an asses head!" said the Wabbit and ruffled his ruffle. Lapinette span around and slapped her thigh twice. "Let us stout men repair to your abode and make merry with your bird machine." she said. "It's not finished," said Leonardo's Cat. "We may assist you complete your arduous task," suggested the Wabbit. "Then I will lead the way," said Leonardo's Cat." "Oh, let's go paw in paw, not one before another," said Lapinette. And so they did.